Woke up yesterday with this image in my mind; I think it will be easy for you to know where it came from. I am very busy now through the holidays but will try to keep you posted. Love each other and eat cookies! Thank you, my beautiful friends (you know who you are) for your kind and loving messages. All is well. The nest is safe. 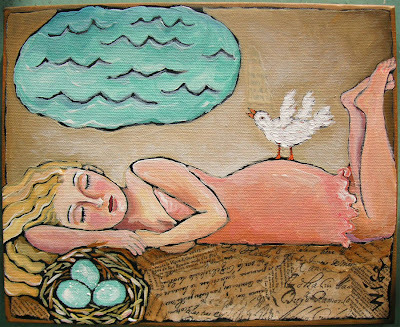 Mama hen was up all night with cotton in her ears, keeping watch during the howling gale. Anxiety disorder hurts. Perhaps we are the sentrys for the race. I feel very emotional and touched this morning by the amount of comfort that comes through the contact we can form over the internet. It is really a miracle. I do not feel alone and that is good. Thank you all again. We are supposed to have another windstorm this evening. They unnerve me. I get weird enough in the winter without the weather; everything seems magnified and tragic this time of year. 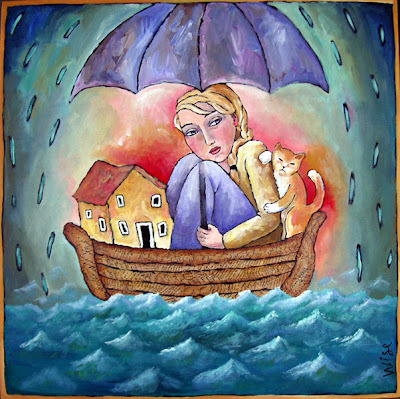 Whenever I feel the fear creeping up on me I know it is time to stop all worldly participation and take stock; meditate, watch the rain drip off the eves, curl up in a ball and let a short time out make me whole again and ready to return. Nothing soothes me as much as nature. When the war is too terrible, the deaths of the innocents too much to bear any longer, I retreat into nature and remember that the trees, the moss, the rain will all endure. I love the earth like my own mother and she always comforts me. No matter what we foolish and selfish humans do to her, she will endure. She is better than the savages she has spawned. In this unusual state of mind (for me) I asked myself if this blog wasn't just a pathetic cry for attention (look at my art! you must!). And then a couple of lovely emails arrived from people who took comfort in words I said and I thought that maybe it doesn't matter if I am imperfect, weird, sometimes afraid, sometimes overbearing. That what matters is that sometimes my intentions help. Winter is the time of the shadow for me. The wind howls, illusions appear and seem convincing enough, the spirit is tested. So forgive me this indulgence, or be glad that I finally let the mask slip for a moment. But just now, with the lights lit and the affluent children eager for new toys, I feel a little off, a little sad and in need of renewal. And it will come I know. It always does. Today I worked awhile and played awhile. Whenever I find myself not quite ready to start a new project I get out my journal and putter. I see what that will lead to; what that will tell me about what is on my mind and in my heart. The layout above was created from a computer generated collage (well, generated by the computer and me - the computer couldn't have done it without me) and a whole lot of multi-media messing around. It is in shades of my favorite color (yellow) but slightly to the cool, linen side of the shade which fits my mood today. I am thinking of southern Spain, of the moorish influence on the art and of the beautiful madonnas and tilework I will see there. The art from this part of the world has always influenced me; the exotic veilings, hidden harems, latticey windows and dark mystery. It draws me to admire and to wonder. Yesterday I was in a pink mood and I created this layout. After I did it my mind wandered to the saying that all paintings are self-portraits. I asked myself what about this girl could refer to me and then thought about how important my purse is in my life. All my stuff is in there; identification, money, bank accounts, lists and notations, curious art supplies, secrets and sundry flotsam. It is the one thing I want to have with me when I lock myself out of the house or my car (please don’t ask). With the purse I have the keys, the phone, the entertainment, the ability to summon help. 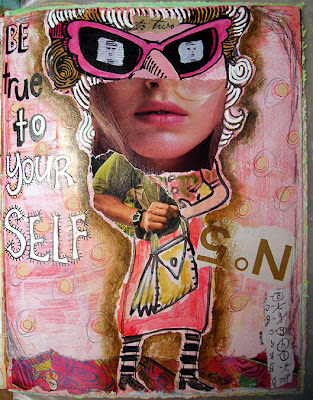 Also this lady is hiding behind her sunglasses, much in the way I have always hidden behind my work, my blog, the ample skirts of my big sister. I am a big ham and still shy at the same time. So yes, I can see how I have unwittingly created aspects of my self in this collage. 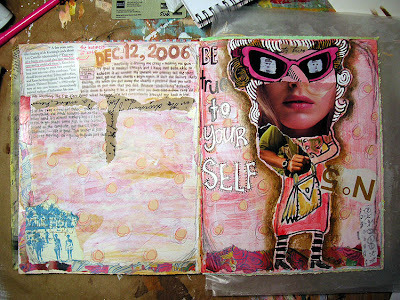 This is what the entire 2 pages looks like of the pink spread. I usually do one major page next to a minor page unless I am just in the mood to rattle on with no artwork. 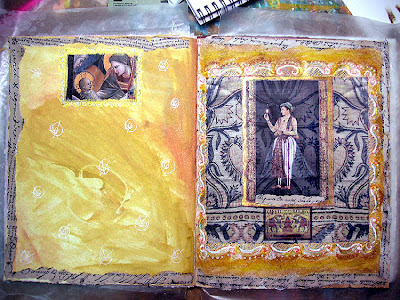 Since I paint so much in the studio I am not compelled to create as much art in my journal. 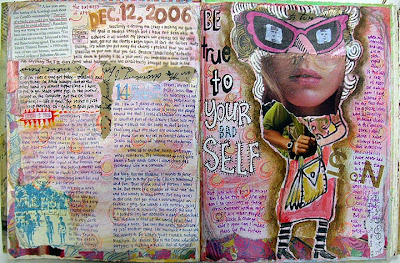 For many years it was a written journal only but when you create a visual pertaining to your life you do unleash the magic and often find inspiration for the next “big one”. So I try to make time for that too. 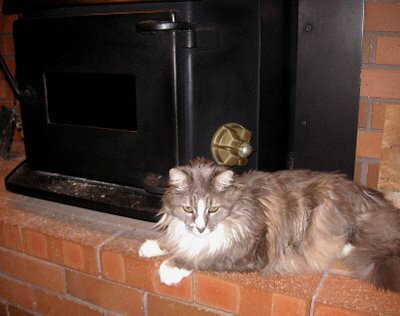 Here is Hermanito keeping watch on the fire. Sometimes he gets so close to the very hot cast iron that I have to catch my breath. He is 17 years old as near as we can figure and he wont even go outside now unless one of us is with him to insure his safety. We live in an area of prowling Toms and dear Hermo knows he is no match for any of them. In the summertime he will "help" John in the garden but this time of year he won't leave his spot by the stove for anything but food. Smart cat. 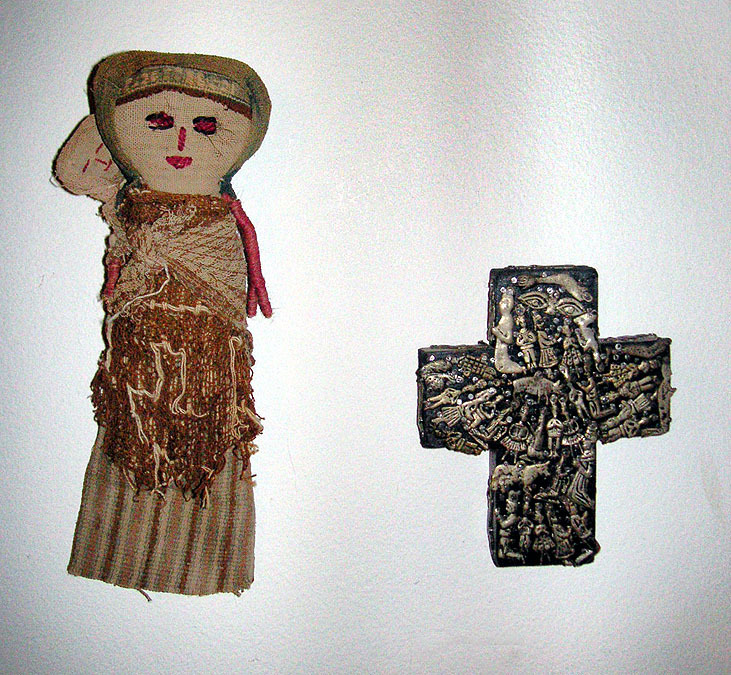 This is a composite photo of one corner of my studio; the one with the little wood stove. Dont worry; the photo is deceiving. The stool on the right is actually smaller because of the splicing of the photos and it is not sitting dangerously close to the stove. Behind it is a ceramic piece by the local ceramic artist Deb Norby. Some years ago she was the artist in residence at the Oregon College of Art and Craft. I was studying ceramics then too. 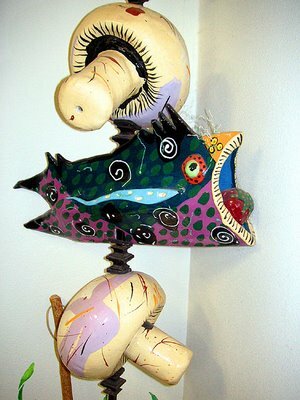 Here is a close up of her piece called "Kabob". I really enjoy it. After I shot these I continued my wander through the house. Here is a shot of the top of a chest that sits by the entrance. The drawing of my daughter is over 20 years old and was sketched off quickly on a sheet of typing paper as she dozed. Amazingly, the paper has not degraded although I am sure it was of the cheapest kind. 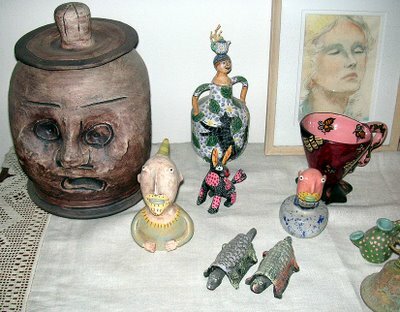 Kim Murton of Vancouver did the two little ceramic faces and John Taylor of Seattle did the big face jug. 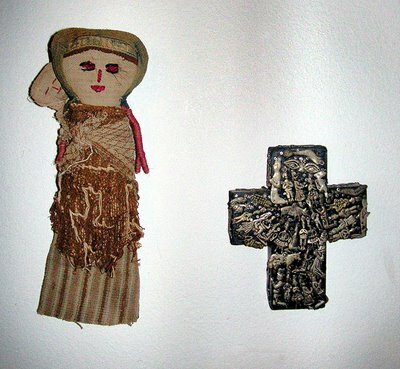 The wall doll and milagro cross were collected somewhere in our travels in the southwest or Mexico, I no longer recall which. As I write this John is out in the kitchen cooking Urud Dal (spicy Indian soup with asophedida and peppers). 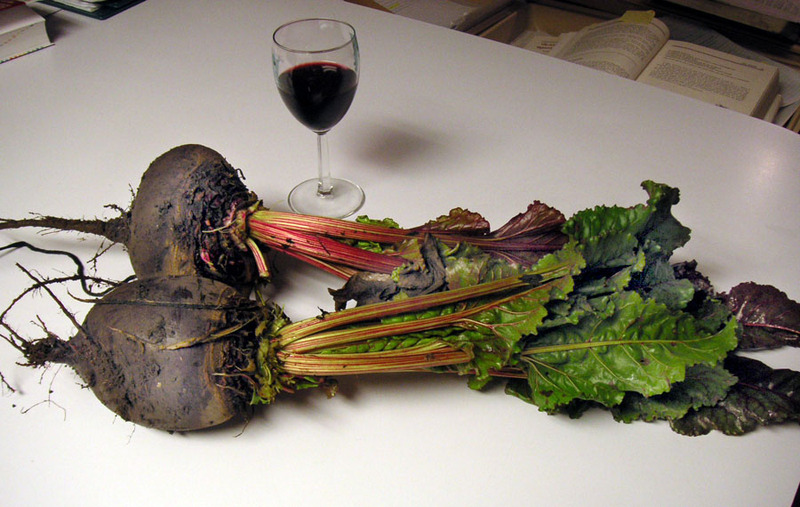 He came in with these enormous beets (wine glass for scale only - ha ha) and said to tell my blog that the mighty hunter went out into the darkness with his blunderbuss and returned home with this "game". So tonite it's soup, squash and beets. Nice visiting with you. If you live in the northern hemisphere, keep warm. If you live in the equatorial or southern climes, well you lucky dogs, enjoy your paradise.